Most of you guys know that you can clear all cached plans using DBCC FREEPROCCACHE. In SQL Server 2008 you are able to clean a single pan from cache. The query below helps you to find the plan. Use DBCC FREEPROCCACHE to clear the plan cache carefully. Freeing the plan cache causes, for example, a stored procedure to be recompiled instead of reused from the cache. This can cause a sudden, temporary decrease in query performance. For each cleared cachestore in the plan cache, the SQL Server error log will contain the following informational message: "SQL Server has encountered %d occurrence(s) of cachestore flush for the ‘%s’ cachestore (part of plan cache) due to ‘DBCC FREEPROCCACHE’ or ‘DBCC FREESYSTEMCACHE’ operations." This message is logged every five minutes as long as the cache is flushed within that time interval. In the next post I will talk about how to force a specific execution plan. I know that it’s a old subject, but I still see many people asking about it in the SQL Server community. Sometimes you might need to convince the query optimizer to generate a parallel execution plan to make your query faster. There is an undocumented trace flag (8649) that will help you with that. Take a look the example below. Now, the same query with QUERYTRACEON 8649. If you need more details about that, check this link. Many times I face questions from development teams “Why ado.net queries run so slow and my SSMS queries are so fast?”. The most common reason of this behavior is about the option ARITHABORT. 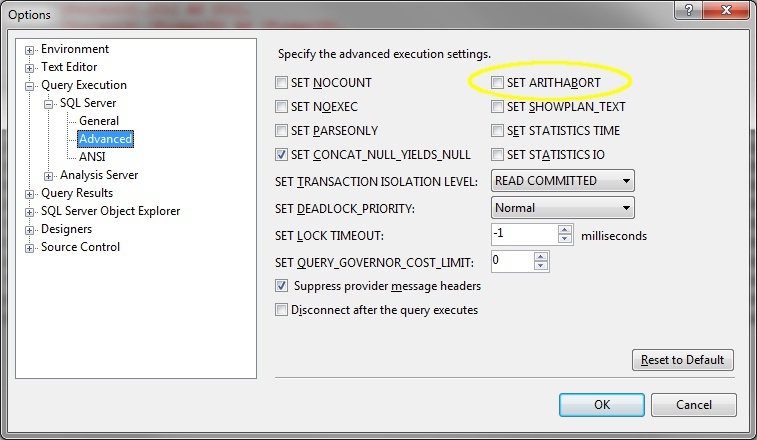 Your application connects with ARITHABORT OFF, but when you run the query in SSMS, ARITHABORT is ON and thus you will not reuse the cache entry that the application uses, but SQL Server will compile the procedure anew, sniffing your current parameter values, and you may get a different plan than from the application. So there you have a likely answer to the initial question of this article. There are a few more possibilities that we will look into in the next chapter, but the by far most common reason for slow in the application, fast in SSMS in SQL 2005 and later is parameter sniffing and the different defaults for ARITHABORT. This and many more issues can be fixed if you read “Slow in the Application, Fast in SSMS? Understanding Performance Mysteries” by Erland Sommarskog.